There are many places to see in Chennai and one of the main ones are the statues that don our street and road junctions. If you have to compress the last 2000 years of Chennai history, we suggest you visit these 10 statues to start with! The Marina Beach, is not only famous for its long sandy beach, but also for the beautiful surroundings, old iconic buildings and more importantly, the various statues of famous personalities all along its length. The Triumph of Labour or the Labour status is situated in Marina beach. It is a bronze statue with rich history. It is listed as one the essential sights to watch according to Lonely Planet. 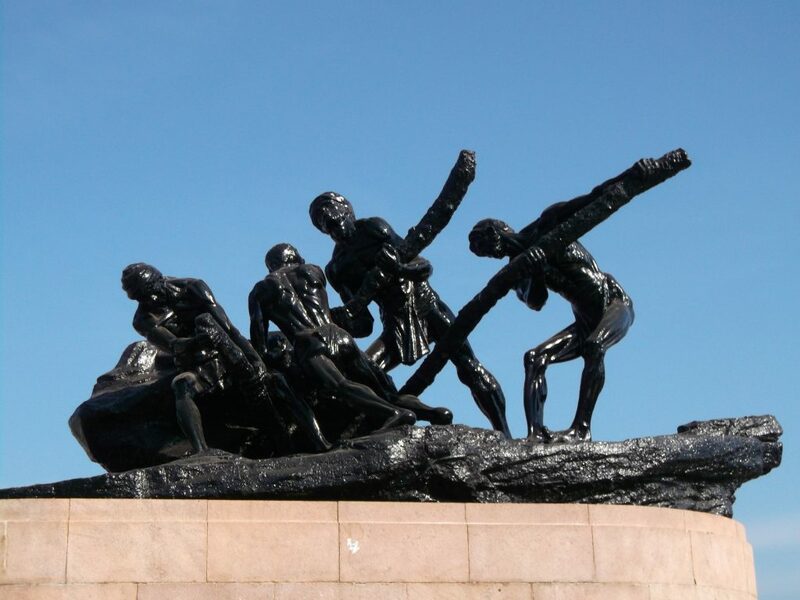 The statue shows four men toiling to move a rock, depicting the hard work of the labouring class. It was sculpted by Debi Prasad Roy Chowdhury. In May 1923, M. Singaravelar, a labour union leader, conducted a meeting at the Marina Beach near Triplicane. He called for for recognition of workers’ rights, and pledged to create a political party to represent the rights of labourers. This was India’s first ever May Day rally. To commemorate this, the Labour statue, depicting an inspiring posture of a team of labourers engrossed at arduous work, was sculpted by Debi Prasad Roy Chowdhury. Mr Debi was was the first Indian principal of the then Government of Madras School of Arts and Crafts (what is today the Tamil Nadu Government College of Fine Arts). The statue was erected on 25 January 1959. It was unveiled by the then Governor of Madras, Bishnuram Medhi. The statue remains the focal point of May Day celebrations in the city. Trivia: A.P. Srinivasan, a night watchman at the School of Arts and Crafts, was the model for second and fourth men from the left. Ramu, a student modeled for the other two men. 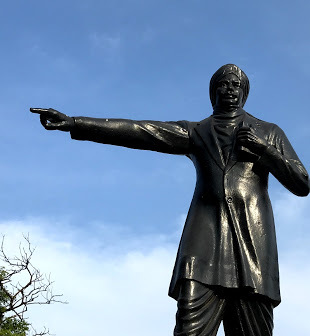 This is the statue of a famous Tamil poet in Tamil Nadu called Bharathiar. His poems aroused the people of Tamil Nadu against the British rule. He also fought against gender inequality, social fads, caste-ism and other evils thronging the society using the power of his ability to pen strong poems. He was also called Maha Kavi. The status is located right opposite the Public Works Department Office of the Government of Tamilnadu. Kannagi is the main character in the Tamil epic called Silapadhikaram, written by Illango Adigal before 1400 years. In the story, she comes to know that her husband had been accused of stealing an anklet of the queen, and put to death by the Madurai King. But she goes to the palace & proves that her husband had not committed the crime. The King, shameful of his hasty decision, dies right there. The legend is that whole of Madurai city was in flames shortly after. Netaji Subhas Chandra Bose was a revolutionary freedom fighter who fought against the British empire in India from outside India (South East Asia). Unlike the leaders of the congress back then, he believed that an armed military campaign against the British was the way to complete Independence and he was helped in this cause by the Germans (initially) and the Japanese (mostly). His reported death after a few campaigns in the North Eastern front of India in 1945 due to a plane crash has never been established till now. Thiruvalluvar, is a very famous Tamil poet who is famous for his work – Thirukkural which contains 1330 couplets and deals with the topics on Virtue, Wealth & Love. Though it has been written 2000 years ago, the poems are considered very relevant, even today. The above statue is an imagined portrait of the great thinker and poet. G U Pope, has translated several Tamil poems and epics (including Tirukkural) in to English over a period spanning 53 years. He has also translated other large volumes like Naladiyar, Thiruvasagam, etc. Bharathidasan is a Tamil poet, writer and playwright whose mentor was Bharathiar. He mostly wrote on socio-political issues that helped the Dravidian movement to rise in Tamil Nadu. He was posthumously awarded the Sahitya Academy award in 1970. Avvaiyar, is the collective name for a group of female poets who lived in 1st/ 3rd/ 13th Centuries in Tamil Nadu. Avvaiyar has written many poems/ songs in Tamil. Aathichoodi is a very popular work among them, which is simple to understand & contains wise words. He was the chief leader of the Indian Independence movement and referred to as the ‘Father of the Nation’. He was one of the first leaders in the world to use Non-violence as the chief means to fight for justice. He discouraged violence in every form and led a very simple life, himself. Veera-ma-munivar (Italian name: Constanzo Beschi) was a missionary who arrived to South India from Europe in the 18th Century. He learned the Tamil language and became proficient enough in it to write a dictionary in Tamil (among other works) and introduced grammar for the popular usage of Tamil. His translations of famous Tamil works in to Latin gave a positive introduction to Tamil Literature in Europe.